Join Anthony Nelson and he shares with Bro. John Ross of the Let’s Talk To The Lord Gospel Radio Show based in Wichita, Kansas. On behalf of the Overcomers Worship Team, Nelson will be sharing with Bro. Ross on the jealousy of God. You don’t want to miss this conversation! Be sure to tune in! Join Anthony Nelson as he shares with WASC-AM (Spartanburg, SC) on behalf of the Overcomers Worship Team. Tune in and listen, as he talks about the Overcomers’ new hit single Jealous, amongst other topics. Join Anthony Nelson, as he shares with KPPM-FM (Lake Charles, LA) on behalf of the Overcomers Worship Team. Tune in and listen, as he talks about the Overcomers’ new hit single Jealous, amongst other topics. Join The Overcomers Worship Team as they praise and worship at the Gospel In The Park event on Saturday, May 11 at the Jambalaya Park in Gonzales, LA. The worship team will specifically be ministering at 6:00 PM CST. The event will be benefiting the River Road African-American Museum. 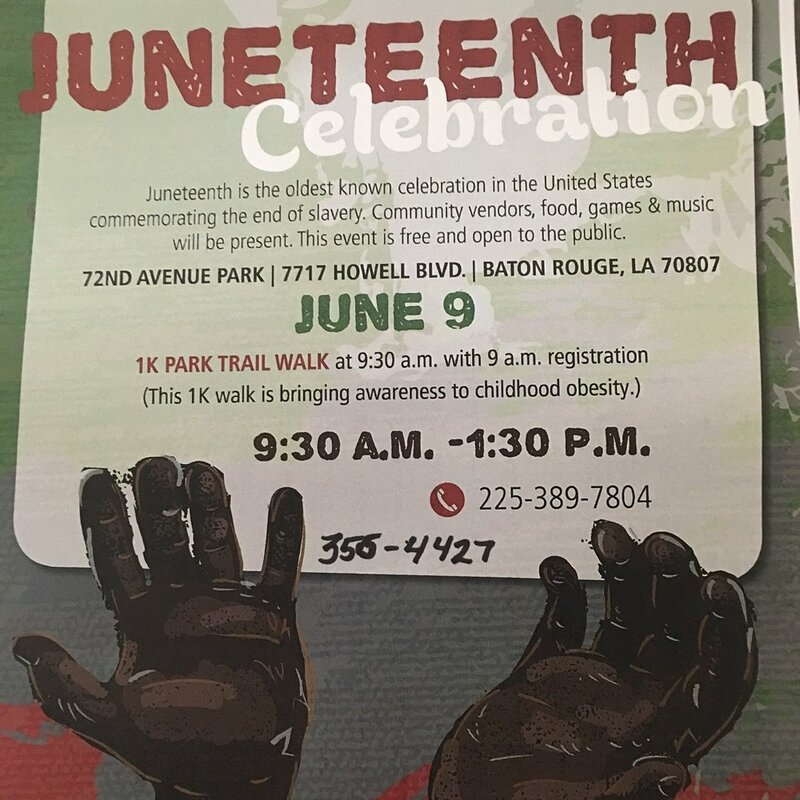 Come and fellowship with Anthony Nelson & The Overcomers as they perform at the upcoming Juneteenth Celebration at 72nd Avenue Park in Baton Rouge, LA on Saturday, June 8, 2019. Join the Overcomers Worship Team as they fellowship, worship and praise at the live taping of the WTQT-FM (Baton Rouge, LA) Gospel concert on Sunday, June 9th @ 5 pm CST. We would love to see YOU there!!! Join Anthony Nelson and he shares with KPPM-FM (Lake Charles, LA) on behalf of the Overcomers Worship Team. Tune in and listen, as he talks about the Overcomers’ new hit single Jealous, amongst other topics. Join The Overcomers Worship Team as they worship, praise and fellowship at the Gospel Extravaganza event in Baton Rouge, LA. Doors open at 3pm, and the event starts at 4pm. Come worship and fellowship with the Overcomers Worship Team, as we honor our Father at the Edward Dufresne Community Center in Luling, LA on April 6, 2019. This organization focus is on domestic violence. They also provide shelter and refuge for individuals who flee abuse. Join the Overcomers Worship Team as we worship and praise our Lord and Savior Jesus Christ and help celebrate several community leaders in Ascension Parish. Join the Overcomers Worship Team as they worship, praise and worship at the 2nd Annual Lagniappe Music & Seafood Festival in Gonzales, LA. Join the Overcomers Worship Team as they worship and fellowship on The Derrick Trufant Show on NOA-TV (Channel 76) in New Orleans, LA. Join The Overcomers Worship Team as they worship, fellowship and help celebrate the 20th Pastors Anniversary for Pastor Charles Oatis of New Mt. Esther Baptist Church in Morgan City, LA. The Overcomers Worship Team will be worshipping with the Body of Christ at the Greater Life Cathedral Worship Center in Gonzales, LA on Dec. 22 @ 6pm. The musical will ultimately be helping the American Cancer Society! Anthony Nelson & The Overcomers will be worshipping at the Donaldsonville Arts, Crafts & Farmer’s Market on the Square event on November 10, 2018. The event will start at 8:30 and end at 12:30 pm. Come and support this wonderful event and explore the local talent and positive, progressive developments in Ascension Parish, particularly in Donaldsonville, Louisiana. Anthony Nelson & The Overcomers will be performing at Mount Olive Baptist Church in Geismar, LA to help celebrate the anniversary of Pastor Sylvia Burnett Payton. Come worship and fellowship with us and glorify God. The Overcomers will be shooting their first video for the Billboard Gospel smash hit, "Everything," with Delvalle Studios in Baton Rouge, LA. We would love to see you in the area. Thanks! Tune into KAZI FM (Austin, TX) with Rev. Manuel Elimuel and Anthony Nelson of The Overcomers for fellowship and fruitful conversation. Be blessed! Come and fellowship with Anthony Nelson & The Overcomers as they perform at the upcoming Juneteenth Celebration at Howell Park in Baton Rouge, LA on Saturday, June 9, 2018. Anthony Nelson & The Overcomers will be performing at The Gospel Music Festival at the Jambalaya Park in Gonzales, LA on May 12th. Come worship, fellow with us and glorify God. This will be a free event to the public and will help support the River Road African American Museum. HELP SAVE OUR MUSEUM!!! For more information, contact Darryl Hambrick at 225-910-3302. Purpose: To unite the local communities in a day of praise through song. This union provides the opportunity for our adults to get revitalized spiritually, to allow our youth to witness a different type of enjoyment and give our families a socially acceptable, spirit filled day in an open setting. Anthony Nelson and The Overcomers travel to Philly, New Jersey and New York City. Live Studio Session featuring Anthony Nelson and The Overcomers at the Presonus Headquarters in Baton Rouge, LA.